Sometimes a tattoo mistake is the artist actually making a mistake or error in spelling, content or placement. But when this happens we have options. More options than ever before. Sometimes we just fail to express out vision to our artist. Sometimes our artist fails to see our vision. There are so very many things that can and do go wrong. Tattoo artist as well as clients are human. We are flawed mistake making people. Some people spend months and sometimes even years deciding on exactly the right tattoo. Some tell a story. Most are personal in nature, a lot can go into making sure your tattoo is exactly what you want…. YOUR vision. Do not expect your artist to “see” the same as you without providing them with pictures.Always have a picture of what you want. I only want part of my tattoo removed. Can I only remove remove part of a tattoo? This is where you go back to paragraph 1. So if you are reading this, I have hope for you. She absolutely loved the job the artist did on the left shoulder. 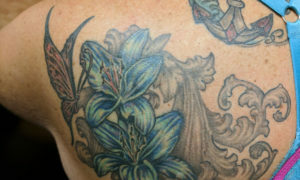 The two blue Hibiscus and Butterfly are Lovely…And this is where things fall apart and laser tattoo removal is necessary. After the flowers were done. She had the other shoulder inked with a similar tattoo with the thought of tying them together one day. They are both very well done. Unfortunately someone thought filigree would go well,and since she was on her stomach, she couldn’t see his “vision” playing out. Can I fix my mistake at Skin City Laser?